Church formally organized and charter members installed. Groundbreaking ceremony held. Mrs. John C. Robinson turns the first shovel. First Sunday service in the new church conducted in the basement. Session votes to install a telephone in the church. Work started on manse at a cost of $11,000. Ruby Burkett and Vera Laughridge the first women to be elected to the session of Robinson Memorial. Church holds a 25th anniversary celebration. Dedication of the stained glass windows. 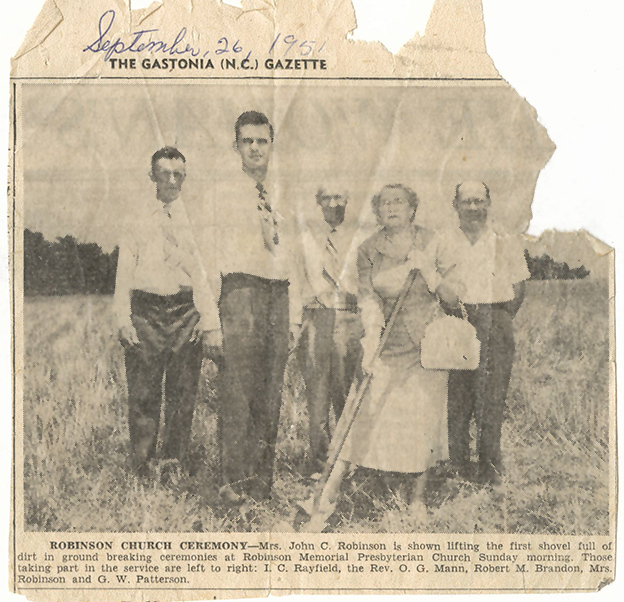 When talk first began of a new Presbyterian Church on Gastonia’s south side in 1951, Robinson Elementary School stood nearly alone on Union Road at the very southern end of Gastonia. Most of the surrounding land belonged to the widow of John C. Robinson, a life-long Presbyterian who died in 1934. As the crow flies, the area was a short distance from Olney Presbyterian Church. But the forecast called for large-scale population growth near the elementary school and the area seemed ripe for a new church. On April 29, 1951, a commission appointed by the Kings Mountain Presbytery met to receive a petition containing 95 signatures asking for a new church. On June 24 the new church was officially organized. In July of that same year, Ola Robinson donated land just north of the school with the provision that it carry the name of John C. Robinson Memorial Presbyterian Church and that a cemetery could not be sited there. In the early months of the church, members worshiped at Robinson Elementary. Groundbreaking for the new church was held Sept. 26, 1951. (Pictured above). Orville Leroy Mann, a Columbia Seminary student, supplied the pulpit from June to October 1951. Additional land north of the church was donated by Mrs. Robinson in 1955 for the construction of the manse. In return, the Session granted her use of the church’s well for her own private use for the remainder of her life. Discussion of an addition on the south side for more Sunday School rooms began in 1966. In 1993 the mortgage was finally retired. And in 2002 the church celebrated its 50th anniversary.